Little Five Points pizza joint with a fun vibe offering thin-crust pies, pastas and more. 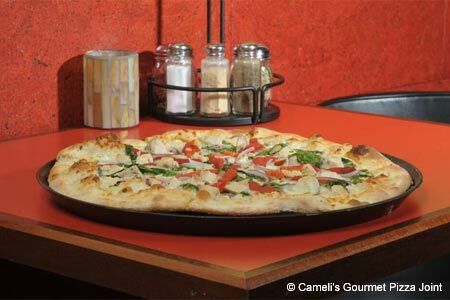 : In Atlanta's Little Five Points neighborhood, brothers George and Joseph Cameli’s pizza joint sports a second level bar and a rooftop patio that offers a view of the city skyline. Unfortunately, this space is not wheelchair accessible. Besides the pizzas, the menu includes pasta dishes and main courses. The most popular items are the thin-crust pies with customizable toppings, available in ten- and 16-inch sizes, and the monster slice. Salads are crisp and fresh, and should be complemented by one of the two house-made dressings. Notable beers are the quaff to target; there is a wine list but we wouldn't suggest more than a few of its offerings. Desserts are mostly cupcakes that change flavors with the seasons. The atmosphere is fun, and it’s popular with the locals.